The Essax Singel is a comfortable racing/sportive saddle that's light and well-constructed for the £75 price tag. It makes great play of its unique AF-Net technology which claims to improve rider performance by 4%; that's a difficult (impossible) thing to measure outside of a controlled conditions lab, but if you're looking for a firm but fairly deeply padded saddle with a generous middle channel, that's not too heavy and not too expensive, you should consider this one. Essax came to prominence because of their Shark saddle that has a protruding fin to keep you in just the right position for optimum mechanical efficiency. That's a pretty niche product but the Singel is much more mainstream with a fairly deep padded section sandwiched between a carbon-fibre-reinforced nylon base and a microfiber cover. The wings are fairly rounded at the rear and there's a channel running the length of the centre of the Singel to relieve pressure on your vitals (Essax market the Singel as unisex). The rails are hollow chromoly. In the independent test Caja Rural rider Garcia Raul Alarcon was asked to hold 200, 300 & 400W for 15 minute periods with a 10 minute rest period between each set at 150W. The test was held over 3 days, testing saddles in different orders and every time the riders heart rate was lower using the Essax saddle to maintain the wattage output. So in short the rider was having to work less to output the same power and when he worked at the same heart rate his power output was greater hence providing a performance gain through Af-Net technology. The test showed a 2.5% perforamce gain with an Essax saddle against a Fizik Arione saddle and in all tests an average of 4% has been found. Quite aside from the fact that holding 400W for 15 mins is a feat most of us will forever aspire to, rather than achieve, the research is interesting rather than in any way conclusive. For a start, the only way to isolate the benefit of the AF-Net tech would be to test exactly the same saddle with and without it, in lab conditions. For all the apparent rigour of the testing process, any benefit may just boil down to the fact that Alarcon's behind was better suited to the Singel than the other saddles he sat on. That wouldn't surprise me, because it's a comfy one. The padding and the shell are both firm but that doesn't translate into a saddle that beats you up. It's firm but accommodating, and gets better the longer you ride. Don't forget: comfort is a performance benefit. I looked at my times on the bike using the Singel compared to rides on the same bike with other saddles, and unsurprisingly there's no pattern. There are too many variables out on the roads (and in my legs and head) that have a far greater effect on my performance than the matrix on the bottom of my saddle does. That's not to say it can't be a benefit; all I'm saying is that the research that Essax have done doesn't clinch it for me. If you're looking for tiny percentage gains and you're a good (and consistent) enough rider for them to make a measurable difference, you may well want to give the Singel a go for that reason. If you're a normal mortal, like me, you mostly care that a saddle is comfy, well put together and decent value, which the Singel is. It'd be a good choice for your sportive bike and it's comfy enough over longer distances if you're doing big rides. It's light enough to go on your race bike too. The Singel is a saddle developed by bike fitting studios. especially designed to relieve pressure in the perineal and genital area. This promotes blood circulation & oxygenation of this part of the body. because of the lack of proper blood irrigation. The design is also perfect for female cyclists and ergonomics. 100% free from genital / perineal pressure. Comfy, fairly light, not too expensive. Nothing really, it's a good saddle. I'm not sold on the science that says it'll make you faster, but everyone knows comfort is a performance benefit. I don't get the expense of saddles. This has a moulded plastic base and machine bent rails. 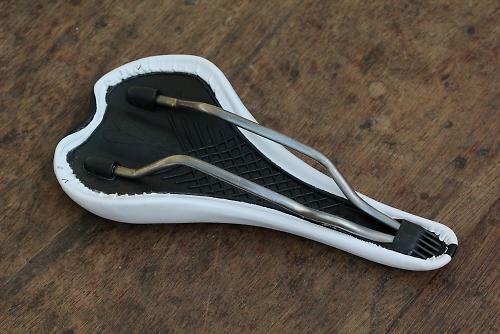 If you think you can design, manufacture, import and distribute a good 220g saddle for £13 a pop then you should. You'd clean up. I've got 2 of them ( one for each bike) and the Singel is the comfiest modern saddle I've used.